This script is an add-on for Item Rarity. 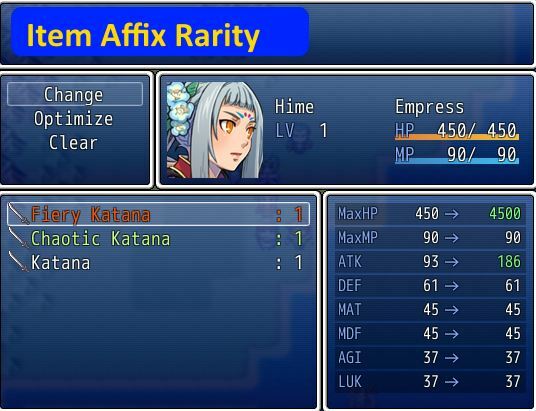 It allows equips to inherit rarity from any affixes. For example, if an item has a rarity level of 1, but then has a prefix with rarity level 4 added, the item’s rarity is now increased to 4 because of the prefix. The rarity for the item will be automatically computed. Hi Hime, line 63 has a problem and doesn&apos;t work when I test it. Script &apos;Item Affix Rarity&apos; line 63: NameError occured. Do you have the required scripts in your project? yep I&apos;ve been using them and it works just fine! So is this problem resolved? That error usually occurs because you don&apos;t have the required scripts, or the order is incorrect. Yep. Thanks for the quick reply.